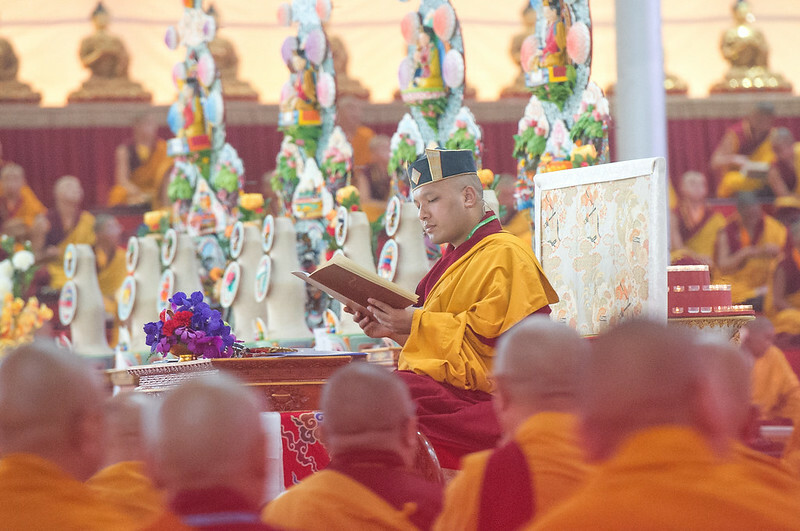 Today, His Holiness reflected on the part of Geshe Potowa’s Long Soliloquy, which had virtue in monasteries as its focal point. He encouraged everyone to nurture enthusiasm and bodhicitta, the essence of which is the union of emptiness and compassion, to guide our efforts to benefit others. Following a short instruction, he concluded with a meditation session. Though he had completed this year’s Monlam teaching, he had not exhausted the content of the whole text and announced that the teaching on the text would extend for one or two more Monlams. Anyone who wants to practice should not even give food to their fellow practitioners with the strings of this life attached. If others give it to you, do not eat it. In the end, it will become a back and forth of food that will eventually cause you to lose the dharma. The Karmapa explained that we should not expect even gratitude. Helping is done best in such a way that people are not aware we are helping them for, if they know, they might feel indebted. Likewise, we might be anticipating some positive reaction from them. Both these responses have a potential to become a basis for conflict. Then His holiness talked about gathering wealth for old age. Though it is understandable to worry about old age, it also indicates not having certainty in dharma. We should take dharma as insurance. When faith in dharma is established, there will be no fear of old age. Clarifying these lines, His Holiness said that the act of going forth or leaving the householder’s life means to be emancipated from samsara. It means seeking freedom. The text explains that the limitations for the ordained are much more subtle than those of a householder. By practising false dharma, their ego clinging and pride intensify to a point where they end up being worse than an ordinary householder. But the Karmapa enheartened his audience: “To practice the dharma, we need to have a certain zeal, enthusiasm, power — strength of mind. We need to have a real belief in what we are doing. Our enthusiasm and fortitude should be stronger than anyone else’s.” He illustrated with the ever powerful example of Milarepa’s perseverance. In contrast, sympathising with the troubles of lamas abroad, he recalled the story of a tulku who travelled to America for the first time. An empowerment was organised in a cinema but no one came. For the sake of auspiciousness, at least one person should receive an empowerment, so someone suggested they call the guard up. They told him how beneficial receiving the empowerment would be and he agreed to receive it. In a later conversation with him, they discovered that he was a Muslim. In that context, His Holiness recalled the profound words of great Drukpa Kagyu Mahasiddha Lorepa: “If you gather crowds of thousands or tens of thousands of people, the benefit to others does not increase. If you only have one person in the crowd then it does not get any smaller.” He elucidated saying that when we meditate upon bodhicitta, which is in essence emptiness and compassion, it is fine to benefit only one being. However, if we don’t have it, even if we have crowds of thousands, we will not fruitfully benefit anyone. For the end of the session, he imparted meditation instructions: “Don’t follow the tracks of the past, don’t anticipate the future. Think about the current situation. Catch that with mindfulness and relax.” Then he expounded on the essence of meditating on the breath. Taking it for granted, we neglect the fact that if we stop breathing we die. Plants produce oxygen and give us the riches which allow us to breathe. Remembering this should give us a feeling of contentment. Since the sound from the singing bowl has a fluctuating quality, he compared meditation on the sound to impermanence. Being aware of it, does not mean we should fear death but see the opportunity to change things due to their impermanent nature. We have a chance to change our thinking. It is impermanence which allows a flute to give rise to beautiful music. Permanence, on the other hand, would mean only one note. His Holiness personally led everyone in meditation by drawing out soothing but powerful meditative sounds from the rim of the singing bowl. As the waves of sound filled the space, he took the meditators into an open state of being. Perhaps this was to show that to meditate on the breath is to attune with the self-resounding sound of the universe.